Those of you that have taken part in the Paris-Brest, LEL, Mille Miglia or the Sicilia No-Stop may know Tony Lonero. Tony lives in Italy and rides with Audax Italia. He is organising a 600km Coast-to-Coast ride across Italy to remember the Americans who gave their lives for the liberation of Italy. 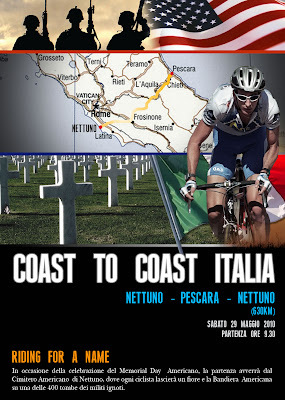 The ride will start in Nettuno and cross the Appenines to the East coast and return back. It looks to be a great event and I hope some of the Willesden can make the trip. I am organizing a historic 600km on 29 May 2010. It is called the Coast to Coast Italy. We leave from my house in Nettuno (near Rome) and ride across Italy and back – about 630km. The ride is to commemorate the 8000 Americans buried at the War cemetery just outside Nettuno. We leave from the baseball field in Nettuno at about 09:00, escorted by the police and 3 jeeps and a landing craft from the second world war, with the folks inside the vehicles dressed up like USA soldiers from the war. We ride about 3km passing through the piazza of Nettuno where the people can clap or throw eggs at us. Arrive at the cemetery, where Joe the cemetery director will be waiting for us. Each rider will have an American flag and Italian flag to put on one of the 400 crosses without a name. Then we ride our bikes up to the monument, I have to lay some flowers give a 5 minute speech , then the riders leave. Newspapers and Foxnews should be here to film this part of the ride. AFN for sure, AFN is the armed forces network of the US military – they are trying to find one us soldier who would like to do the event with us. It is going to be a special day. If you want to come, I have some room at the house, there is a hotel up the road for €30/day for the riders. The route will take the same course out and back. We have to make a few changes but it will be along this route, some climbing to do but the roads are nice. This is our biggest ride of the year, I think we will have around 200 riders. Down on the other side Italy at Silvi Marina there is food, tent to sleep in and showers.